Independence: 18 January 1871 (German Empire unification); divided into four zones of occupation (UK, US, USSR, and later, France) in 1945 following World War II; Federal Republic of Germany (FRG or West Germany) proclaimed 23 May 1949 and included the former UK, US, and French zones; German Democratic Republic (GDR or East Germany) proclaimed 7 October 1949 and included the former USSR zone; unification of West Germany and East Germany took place 3 October 1990; all four powers formally relinquished rights 15 March 1991. 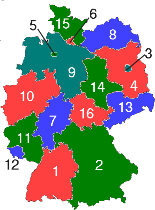 Divisions: Germany is divided into sixteen states. See the map below for the location and names of the states. 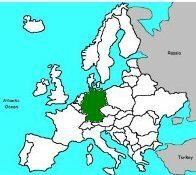 The largest states by population are North Rhine-Westphalia, Bavaria, and Braden-Wurttemberg. Some of the states are city-states such as Berlin and Hamburg. Other Holidays: New Years' Day (January 1), Good Friday, Labor Day (May 1), Ascension Day, Whit Monday, German Unity Day (October 3), Christmas Day (December 25), Boxing Day (December 26), Oktoberfest is a festival held in Bavaria that lasts 16 days from late September to the first weekend in October. 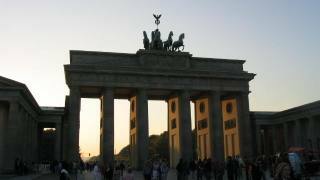 Origin of the name Germany: The name "Germany" comes from the Latin word Germania. It was first used by the Gauls and then later by the Romans and Julius Caesar. The Germans call their country Deutschland.